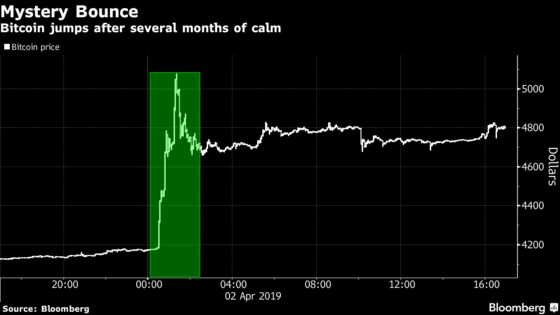 (Bloomberg) -- Add algorithmic hedge funds to the list of suspects behind Tuesday’s sudden surge in Bitcoin that had the true believers in the digital asset world heralding a renaissance in the most-popular cryptocurrency. Long the bane of traditional discretionary traders in areas such as equities for exaggerating price moves and volatility, these computer-run strategies have been increasing in popularity in what has primarily been seen as retail focused market. The more than 20 percent surge in Bitcoin in less than an hour at the start of Asian trading on Tuesday was likely triggered by automated software set up to execute a $100 million trade across three exchanges, according to Oliver von Landsberg-Sadie, chief executive officer of London-based crypto firm BCB Group. Instead of depending on human eyeballs, the funds use automated software to spot and sometimes buy into market opportunities around the clock. Some execute thousands of trades a day, while others trade once every couple of days and make money on arbitrage of coin prices or derivatives. While crypto hedge funds as a whole lost nearly 72 percent during last year’s market meltdown, some algo funds said they booked gains of between 3 percent and 10 percent a month throughout 2018. "Some people are in the camp where algorithmic trading is a manipulative device, and others are of the view that they are a way to make markets more efficient," von Landsberg-Sadie said. "I am definitely of the second view." BCB Group helps clients place large algorithmic trades to minimize market impact. The $400 million Alphabit fund began shifting assets into algorithmic trading in the last six months, Michael Terpin, a general partner at the fund, said in a phone interview. In November, deVere Group, one of the world’s largest independent financial advisory organizations with more than $10 billion under advise and administration, dived into crypto algo arbitrage. Some 26 algo funds were launched in 2017 and 2018, according to Autonomous Research. Many more algo funds formed recently are operating in stealth mode, Wei Zhou, chief financial officer of the world’s largest crypto exchange, Binance, said in a phone interview last month. "These are going to be the new rock stars of our industry, a lot of these smaller guys," Zhou said. "What we are seeing is a lot of younger, up-and-coming fund managers are trying their hand out in this industry. At least from trading volume and demand perspective, they make up a much larger proportion of the market today." The influx of algo traders also raises the risk for market manipulation. Some algo funds do spoofing, where they flood the market with fake orders to trick other traders into buying or selling, Travis Kling, founder of the Los Angeles-based crypto hedge fund Ikigai, said in a phone interview. "Humans will let things get out of whack in a more extreme manner than machines will," Kling said. Algo traders "by definition put a lid on volatility," he said. Already current seven-day annual Bitcoin volatility is about 5.8 percent, down from 13.6 percent six months ago, according to CryptoCompare, which tracks crypto exchanges. March has been less volatile on average than the prior four months, Constantine Tsavliris, head of research at CryptoCompare, said in an email. "Algo trading is much easier in crypto than traditional financial assets," Aaron Brown, an investor who writes for Bloomberg Opinion, said in an email. "Most exchanges have simple APIs -- that is, interfaces for automated trading -- while traditional exchanges require expensive connections and permissions and have lots of rules. So crypto algo trading has always been an activity for technically sophisticated financial amateurs."